Samsung has won a UK High Court case against Apple over the design of the firms' respective tablet computers. 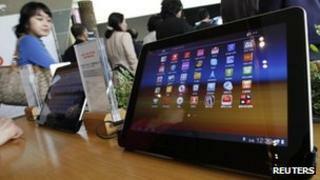 Apple brought the case alleging that Samsung's Galaxy Tab 10 infringed the design of its iPad. Judge Colin Birss disagreed saying Apple's designs were not being infringed because Samsung's Galaxy Tab was not as "cool" as the iPad. As a result, he said, few would confuse the two even though they appeared superficially similar. The ruling by Judge Birss means Apple cannot block sales of the Galaxy Tab on the grounds that it too closely resembles the iPad. In a statement Samsung welcomed the ruling and added: "Should Apple continue to make excessive legal claims in other countries based on such generic designs, innovation in the industry could be harmed and consumer choice unduly limited." Apple declined to comment specifically on the UK case but, in a statement, repeated its view that there was no "no coincidence" that Samsung's latest products resembled the iPhone and iPad. It added: "This kind of blatant copying is wrong and, as we've said many times before, we need to protect Apple's intellectual properties when companies steal our ideas." Apple now has 21 days to appeal against the judgement. The decision is the latest in a series that have gone against Apple. On 6 July a US court lifted a sales ban on the Galaxy Nexus smartphones although it upheld a ban on sales of the Galaxy 10.1 tablet. Earlier in July, a UK court ruled that Apple's patent covering a "slide to unlock" function could not be enforced against HTC.